Treat yourself to some southern charm with this delicious banana pudding recipe. Satisfy your need for crunch when you dine on this delicious Doritos taco salad. Fresh out of the oven, strawberry banana bread is the sweetest treat summer has to offer. Peanut butter chip fudge brownies are made with the best ingredients…peanut butter and chocolate! Sweet and tart, rhubarb crisp is one of the best desserts to come out of summer. Sink your teeth into the velvety layers of chocolate beet cake and enjoy the wave of pure dessert ecstasy that washed over your senses. Make The MOST SUCCULENT Oven Roasted Baby Back Ribs You’ve EVER Had! No, That Ingredient Amount Is Not a Typo. Just Trust Me, Try It and I’m Sure You’ll Agree! Click here for the delicious recipe! 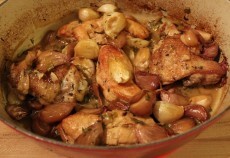 You Won’t Believe What These Chicken Thighs Are Swimming In! Click here for the super delicious chicken recipe! This is like a trip to an old-school family restaurant.